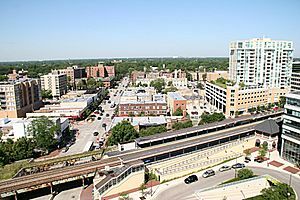 Evanston /ˈɛvənˌstən/ is a city in Cook County, Illinois, United States, 12 miles (19 km) north of downtown Chicago, bordered by Chicago to the south, Skokie to the west, and Wilmette to the north, with a population of 74,486 as of 2010[update]. 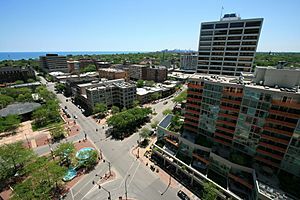 It is one of the North Shore communities that adjoin Lake Michigan and is the home of Northwestern University. 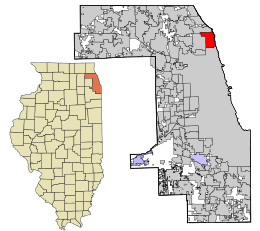 The boundaries of the city of Evanston are coterminous with those of the former Evanston Township, which was dissolved in 2014 by voters with its functions being absorbed by the city of Evanston. As of 2011[update], the estimated median income for a household in the city was $60,033, and the median income for a family was $102,706. Male full-time workers had a median income of $66,106 versus $52,727 for females. The per capita income for the city was $40,732. About 6.4% of families and 12.1% of the population were below the poverty line, including 14.1% of those under age 18 and 6.5% of those age 65 or over. Evanston, Illinois Facts for Kids. Kiddle Encyclopedia.